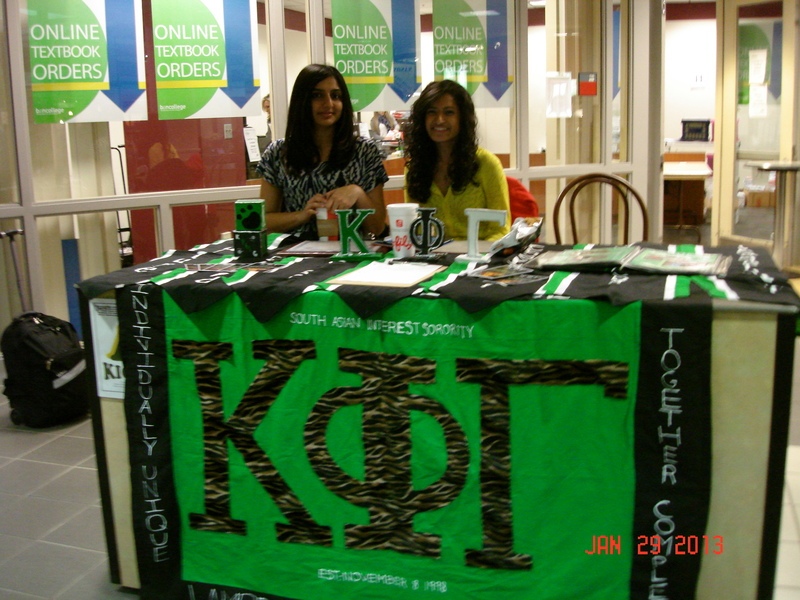 Natasha John and Afshan Hassan are members of a South Asian sorority–Kappa Phi Gamma–at George Mason University, and they are calling all Mason women to join them. To help them achieve that goal, Hassan and John are operating a kiosk in the Johnson Center. They have decked it out in green and black and gold and topped it with informational materials. “Right now, we only have five members on our campus,” said Hassan, a Mason graduate student studying education. Nationally, though, the organization has 700-900 members, she said. “We’re not very big. That gives us the ability to connect with one another,” she said. John said Mason women should know that they don’t have to be of South Asian descent to be a part of the organization. “We kind of look for all kinds of girls who are interested in learning about our culture,” she said. 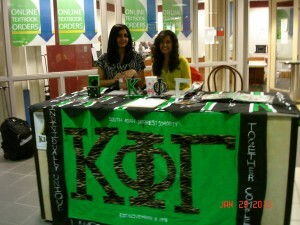 Those women who are interested in joining should “Come out to our Rush Week events,” John said. “After that we hold interviews,” she said. Women who enter the group will gain self-confidence and leadership skills, John said. Freshman biology major Raiga Somjee stopped by the kiosk and looked over the materials on display. “I don’t know much about it,” she said. John and Hassan hope similar students will seek them out to learn more.